This book is produced with the meteorite collector in mind. The format will make it a useable and quick reference for both the collector as well as the serious meteorite enthusiast. It is divided into two main sections. 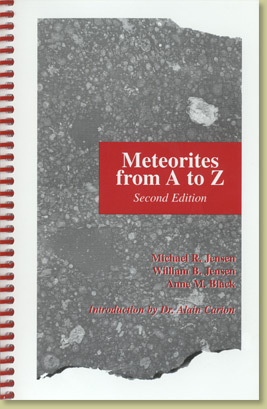 The first section, or main body of the text, includes all non-numbered Sahara and Antarctic meteorites through January 1, 2004. The second part lists all of the numbered Saharan and Arabian peninsula meteorites through January 1, 2004.
Credit Authors: Michael R. Jensen, William B. Jensen, and Anne M. Black. Introduction by Dr. Alain Carion. Notes Soft Cover, spiral bound, 275 pages.